By Scott Gilfoid: The general thought from most boxing fans is that Tyson Fury (24-0, 18 KO) simply doesn’t have the punching power to get the job done when he steps inside the ring to face IBF/IBO/WBA/WBO heavyweight champion Wladimir Klitschko (64-3, 53 KOs on November 28th at the ESPRIT Arena in Dusseldorf, Germany. There’s no doubt about it that the 27-year-old Fury can’t crack eggs with his punches, and that obviously is a real problem for him going in with a guy with Wladimir’s punching power and hand speed. But I think Fury’s biggest problem isn’t his feather-fisted power. I think what more of a problem is for Fury is his lack of technical skills. He’s just too sloppy with his skills to beat a ring technician like Wladimir. Fury has been able to get away with being so crude and primitive with his fighting style thus far because he’s never beaten anyone good yet. Sorry, I don’t consider Dereck Chisora or Steve Cunningham, Fury’s two best wins on his resume, as being good heavyweights. Fury is just too sloppy for his own good, and that’s going to be brought to life when he gets inside the ring with Klitschko next month. Even former heavyweight champion Lennox Lewis agrees with me about Fury lacking the technical skills to get the job done against Klitschko. I wouldn’t go so far as to say that Fury will get knocked out if he doesn’t have an answer for Wladimir’s jab. I think it’s more of a case of Fury’s face getting turned into hamburger if he doesn’t have an answer for Wladimir’s jab. Fury has the longer reach, but he doesn’t have a good jab. In other words, he can’t bend forward to use his jab at long distance the way that Wladimir can, and he can’t throw power shots from long distance for some reason. This is the same problem that Anthony Joshua and David Price both have. For some reason all of those fighters need to be at medium to close distance for them to throw their jabs and power shots. I’ve never seen any of them show the ability to stand at long distance and throw jabs all night the way Klitschko does, or throw power shots. I think it’s a flexibility issue with their upper bodies, and of course an athletic issue as well. That’s why Klitschko would dominate the likes of Joshua and Price, and of course, Fury as well. The only heavyweight in the division that can throw a jab from long distance, besides Klitschko, is the talented Deontay Wilder. He throws a beautiful jab from the outside, and he also can throw power shots from the outside like Klitschko. Further, Wilder also can move like Klitschko around the ring. There aren’t any big heavyweights that can move like Wladimir and Deontay. Heck, Fury, Joshua and Price all move like they have their feet stuck in a foot of thick mud. The mobility just isn’t there with those guys. “Klitschko is the champion right now. Who is Tyson Fury? He needs to prove himself right now. All these antics of his don’t make him a good boxer; all it does is makes him a good showman,” Lewis said. This is boxing. If he’s so great, let’s see that greatness come out. [Klitschko-Fury] is an interesting fight. It’s two big guys who are basically the same size, and we’ll have to see how Klitschko does against a guy his size. 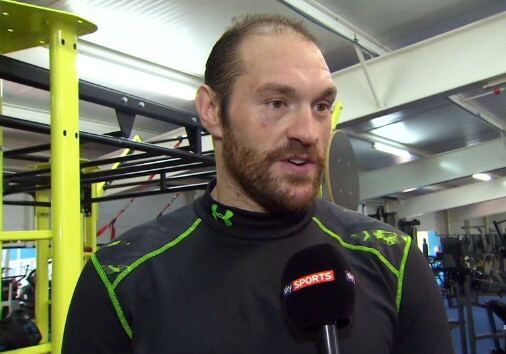 But if you ask me, Klitschko’s technically better than Tyson Fury,” Lewis said. Well, of course, Klitschko is the more technical fighter than Fury. I think it goes without saying that Klitschko is the much better technical fighter than Fury. That’s something that Fury is going to need to try and figure out how to make up for. He’s not a pressure fighter, but he’s going to need to try to put a lot of pressure on Klitschko in this fight if he wants to win, because that’s the only chance he has of beating him. Fury can’t stand on the outside and exchange power shots or jabs with Wladimir all night long because he doesn’t have the ability to fight on the outside. The only way Fury wins is if he puts pressure on Wladimir the way Lamon Brewster and Ross Puritty did in their wins over him.